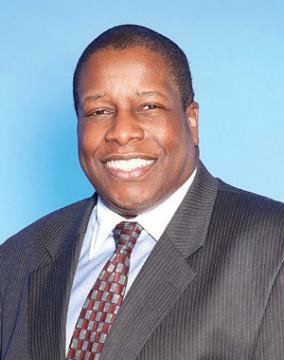 Last night, in the ballroom of New York’s Waldorf-Astoria Hotel, packed with the most prominent and powerful players in advertising, BLACK ENTERPRISE Publisher Earl G. Graves, Sr. was inducted into the Advertising Hall of Fame, receiving the industry’s highest honor. 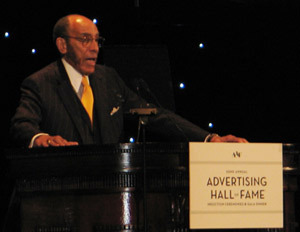 One of eight inductees, Graves joined the ranks of advertising pioneers and icons due to his contributions for raising the standards of advertising excellence by using BE as a platform to diversify images of African Americans in business and communicate the power of the black consumer market, Frank Cooper, senior vice president & chief consumer engagement officer for PepsiCo Americas Beverages and chairman of the American Advertising Federation, the leading industry trade association, said in his presentation of the award. He was also recognized for his major achievements in business, media, politics and philanthropy. Another milestone was the AAF’s selection of comedian Bill Cosby, the first non-athlete black celebrity endorser, as the inaugural recipient of the President’s Award for his lifetime contributions to advertising. Graves and Cosby were in good company. 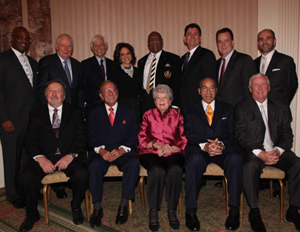 Other inductees were Southwest Airlines Founder Herb Kelleher; Jack Conners, Jr., founding partner of top marketing communications firm Hill, Holiday, Connors, Cosmopulus, Inc; David Abbot, retired chairman and creative director for Abbott Mead Vickers, the largest agency group in the UK; Jack Smith, former deputy creative director of advertising giant Leo Burnett; trailblazer Laurel Cutler, a director at Foote, Cone & Belding, the nation’s largest agency; Eduardo Caballero, founder of the country’s largest Spanish language rep firm and the first Latino to ever to receive the honor; and auto manufacturer General Motors, one of the world’s largest advertisers. Past inductees include CNN founder Ted Turner, former Chairman & CEO of NBC Universal Bob Wright, the late founder of Time Inc., Henry Luce, and the late founder and publisher of Ebony and Jet, John H. Johnson. The 62nd induction ceremony brought out industry leaders including BE 100s CEOs such as Don Coleman of GlobalHue (No. 1 on the BE ADVERTISING AGENCIES list with $483.5 million in billings); Carol Williams of Carol H. Williams Advertsing (No. 2 with $280 million in billings); and Bryon Lewis of UniWorld Group Inc. (No. 3 with $202 million in billings). 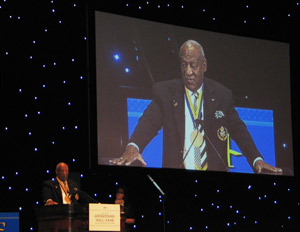 Cosby, who appeared on the December 1981 cover of BLACK ENTERPRISE and was cited as the nation’s top star presenter in advertising, also discussed the value of media in breaking barriers. In fact, the veteran entertainer received his first commercial prior to becoming the first black actor of a dramatic series, I Spy, in 1965 when he called cigar manufacturer White Owl to serve as an endorser. In receiving his honor, he noted “that a lot of people had special meetingsâ€ about whether to put him on air and he recognized those who took a chance on him. Lacing his remarks with humorous asides, he discussed the need to “level the playing fieldâ€ for blacks in different arenas — he and his wife invested $1 million and convinced the company Service Merchandise to sponsor Willy T. Ribbs, the first African-American to qualify for the Indy 500, some 20 years ago — and how the media industry can still bring about significant cultural change.